And all I’ve been thinking about for the last two weeks is what to ADD to our annual Super Bowl spread (as well as what to delete) to keep variety, that good old ‘spice of life’ into the traditional mix. Cheesy Artichoke and Garlic Bread with a blend of four Italian cheeses was my top choice to add this year. I experienced my first bite of this bread at a friend’s party back in 2000. 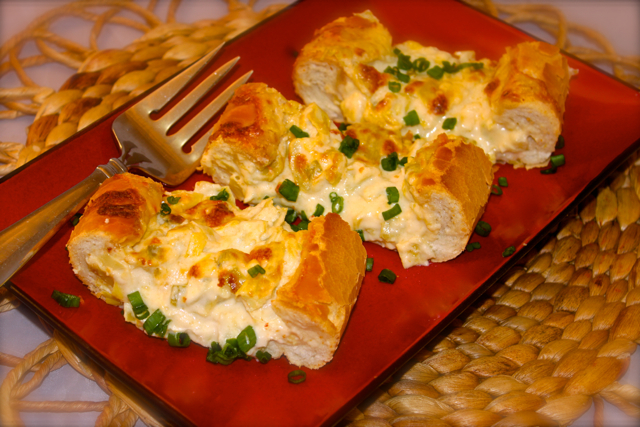 I absolutely fell in love with this amazingly delicious cheesy, garlicy bread! Any recipe with artichokes gets me every time and this recipe is at the top of my unforgettable recipes. Thank goodness she shared her recipe with me, which I’ve tweaked (quite) a bit. 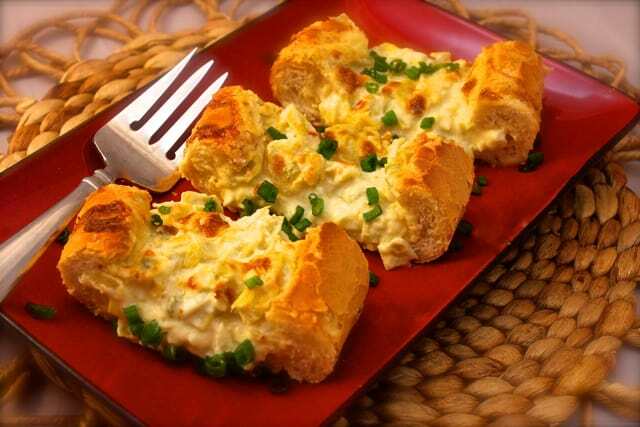 If you like artichoke dip, then you’ll flip over this cheesy bread! Chunks of yummy artichoke hearts mixed in a plethora of cheeses and garlic, then baked to a melted, bubbly concoction of golden cheesy perfection . . . inside a loaf of Italian bread baked to a nice crispiness on the outside, yet soft and moist on the inside. This year we’re just having a small gathering in front of the tube, so I decided to eliminate the Italian Sausage and Pepper Sammies that we’ve had in previous years. We always include our hot and spicy “Some like It Hot’ Chili”, as well as our awesome Guacamole that was chosen as one of Foodista’s best recipes for Guacamole. We added some baked buffalo chicken wings, a sausage queso dip with mini peppers for dipping, and from my archives dated back to 1979, a veggie dip that has withstood the test of time (all recipes will be in upcoming posts)! I hope you try this Cheesy Artichoke and Garlic Bread and check out the recipes for our Super Bowl spread too. What did you add to your Super Bowl feast this year? I’d love to know for future parties. Leave a link too so I can find it on your blogs! Excuse me while I go pig out a bit . . . hey, it’s the Super Bowl! Slowly and gently heat the olive oil. Add garlic and green onions, sauté for a few minutes, do not burn the garlic. Add all of the remaining ingredients (except the bread). Heat until all ingredients are hot and blended together. Slice the top of the bread off, lengthwise, but not completely in half. Scoop out a “little bit” of the interior bread (save to use and dip into artichoke mixture). Pour the artichoke-cheese mixture into the bread shell. Bake on the bottom rack of oven until it begins to turn golden brown and bubbly. Broil for only 1 or 2 minutes (still on the bottom rack). Keep a close watch on this so that it does not burn. Allow to set for about 10 minutes to allow the heated cheese to harden up a bit, so that it’s not runny. Garnish with minced green onion stems. Can be made ahead and wrapped in aluminum foil and kept in the oven on low to keep warm! I am such a HUGE garlic bread fan. Add cheese and artichokes and I’m over the moon! Thanks for sharing! I am the exact same way Hezzi-D! Exact same way! Garlic, bread, cheese, and artichokes…what is not to like?! My sentiments exactly! I have to be careful and not eat more than one slice, Nichole! Gooey and cheesy…o my..this is one fantastic meal! I just love garlic bread! I love that you added artichokes to it! Yum! Thanks Jennifer, we really enjoyed the combination! Put any cheese on any bread and I am there with bells on. This looks fantastic! Thanks! Are we cheese and bread soul sisters Julie? MUST BE! You really can’t go wrong with any kind of garlic bread. This one looks really addictive too! I couldn’t agree more Constance! This is a perfect way to serve this awesome dip, I just love this cheesy presentation and its pinned. Hope you are having a great weekend and thanks so much for sharing. 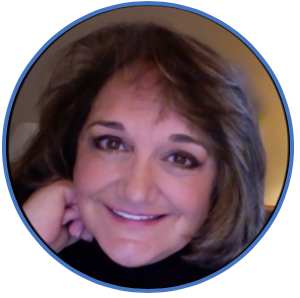 It’s always such a pleasure to hear from you Miz Helen! You make me smile! Nom, nom, nom, gone!! I would love these as I adore artichokes cheesy anything!! I’d nom, nom, nom alongside with you! Agreed Samantha! Thanks for your kind visit! Roz, you are the artichoke queen, and I’m loving this recipe. Wish I would have seen this before today. I’ll have to pin it to try later. And heading over to take a look at that guac. You can never go wrong with that. What a fun food and spirit filled day. Loving our #SundaySupper group. I’m so glad you’ve joined . . . lots of great recipes and peeps! Oh my gosh – this looks fantastic. I would sit right next to this dish and never move. That’s too funny! I guess we’d have to fight over the chair! You are speaking my language here! This Cheesy Artichoke and Garlic Bread looks AMAZING!!! I love it! Thanks Betsy; I’ll be right over! Maybe someday we could have a joint ‘virtual’, ‘cyber-space’ bowl game party! You bring the sweet treats and I’ll bring the savory . . . it would be outrageously delicious, Liz! This recipe makes SO much sense! I love artichoke dip AND garlic bread. It’s perfect at the same time! I’m glad that you like it Shannon! Thank you! Oh my goodness Roz,… this bread looks scrumptious! I love all the cheeses you used AND I am a huge fan of artichokes! I love my ‘chokes too Manu! Artichokes, bread, and cheese are a perfect trio! What an excellent addition to a game day spread. Thank you Renee! I appreciate it! My family too Sarah! Thank you for your sweet comment! How are doing this fine spring day? 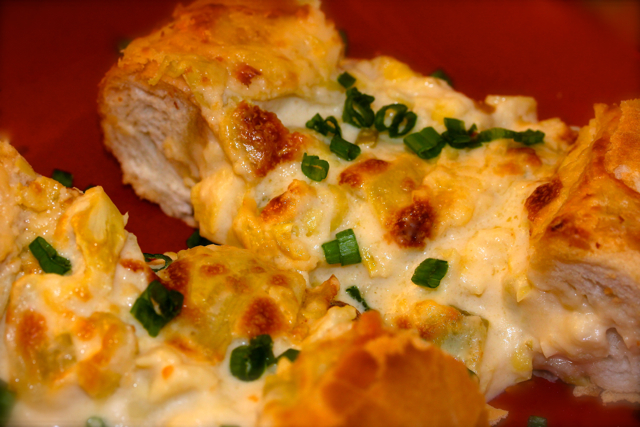 oh. . cheesy artichoke and garlic bread . . oh my word. . how delicious! You had me at cheesy!!! yum! Thank you Alice! Cheese is so hard to deny! PINNING and making this just as soon as possible. Thanks for sharing this delicious recipe! You’re so welcome Renee, it’s my pleasure to share it! This bread takes artichoke dip to a whole new level! Yum! I hope so Bobbi, it was dinner for me and it was ALL MINE! Yum! Who doesn’t love a good cheesy bread!! Love your version, my mouth is watering as I type! It’s a weakness of mine Tammi! THis sounds amazing! The bread is a perfect for any weekend gathering, and you gave a wonderful list of appetizers for the game. I am sure the men in your family love attending your parties,no matter what sport event is on! Hi you two! Oh yes, lots of guys (and gals) love to come over and nosh on some good eats during sports events! And I’m sure it is the same way in your homes! This is a lovely bread and beautifully photographed as well. You have a lot of good stuff here, I could eat like a gavone here. Thank you so much for your kind comments regarding my anise biscotti, I am happy to be here. Oh by the way – I have no affiliation with a Grits and Groceries restaurant, one such is in nearby South Carolina. I always liked that Little Willie John song when I was an adolescent and used that for my blog title. Oh, I get it now! Thanks for the clarification Anthony! it’s a favoulous receipe! good! see you!!!! Grazie mille Annalisa! Come stai? Buona serra amica! Shaina, I agree with your love of artichoke dip! I can never refuse it. I hope that you enjoy this recipe. This looks absolutely gooey and delicious and I want some. I love artichoke and I love it on this bread!! I am a sucker for artichokes and bread too Nicole! A very bad habit to repeat far to often! Oh gosh Roz. I wish I had seen this before the Super Bowl, so I could have taken it to a party. But it would be great for any time company was coming too – I love all those gooey cheeses mixed with the artichokes. Wonderful minds think alike Linda! Thank you! Hi Roz! It’s good to meet another Italian foodie here on blogdom! I agree, ‘mi piacere, Laurie” I’ll be right over to read your blog!!!! Hi Roz this recipe sounds amazing and I love artichokes.. will be trying soon. HOpe your doing well. Seems Like I keep missing some of these great recipes I may have been following the wrong blog … this is awesome nice new change! Take care bella! Hi Claudia, Yes, I changed blog ‘carriers’ a year ago. Miss chatting with you! This must have been a big hit at your Super Bowl Party! It just looks heavenly. I love anything melty and cheesy. I am definitely saving this recipe to make soon! I am also going to check out your guacamole recipe. You would think being from Arizona, I would have one of my own, but I just haven’t found one that is my favorite yet. Thanks for sharing your delicious recipes! Melted, ooey, gooey cheese is a weak point of mine too Shari! I hope you enjoy the guak recipe that shared; it’s pretty basic, but pretty damn good too! I miss Arizona whenever I enjoy chips, salsa and guacamole! Wow, does this every look decadent and rich and naughty– right up my alley, LOL! I’m weeks behind in visiting my favorite blogs. I could make a meal of this, with a glass of beer. Very easily! I know how that goes too, Debby! It takes me days and weeks to catch up too!